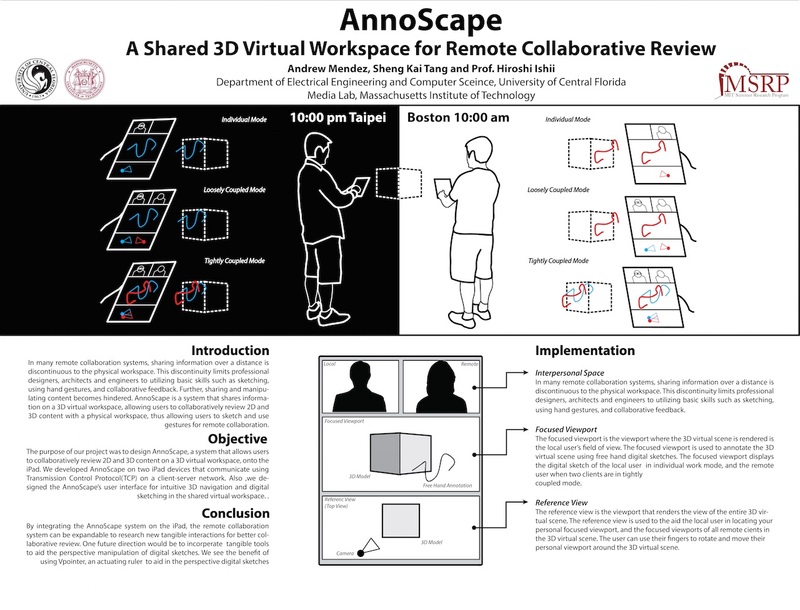 In the Summer of 2013, I completed a nine week internship at the MIT Media Lab where I worked with Professor Hiroshi Ishii and a graduate student, Sheng Kai (Tony) Tang, on the Annoscape project. My research project involved developing a mobile platform that allowed users to collaboratively review 2D and 3D content on a 3D virtual workspace using mobile devices. Developed an iOS application where users on a network can draw digital sketches and collaborate in a 3D virtual workspace in real-time. The iOS application was developed using openFrameworks iOS C++ library and OpenGL. Designed the remote collaboration system to be expandable to research new tangible interactions for better collaborative review. Future directions would include incorporating tangible tools to aid the perspective manipulation of digital sketches.